The Three Graces, otherwise known as Crab Rocks, is a beautiful dive site right off US101 just west of Garibaldi, Oregon. We love coming here to dive for the scenery above and below water. The complex and ever changing currents make this a fun and challenging site to navigate. We have had great luck spearfishing and crabbing here in the past. 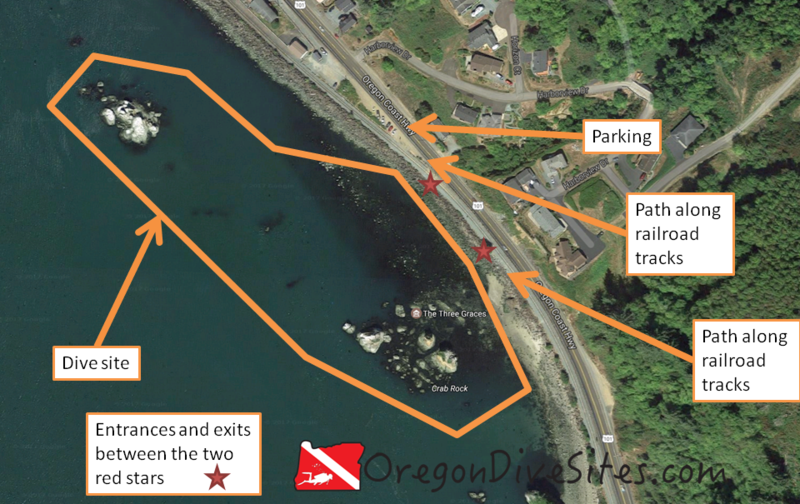 This is one of the easiest sites to access in Tillamook Bay. The entrance and exit are easy and straight forward compared to the jetty dive sites. The scenery is breathtaking. The crabbing and spearfishing are pretty good. And the tricky currents that are constantly changing make this a fun navigation puzzle. Look for the parking on the west side of US101 just north of the Three Graces. Parking is free and plentiful. We have heard from some of our SCUBA friends that sometimes people’s cars get broken into here if a bunch of expensive looking equipment is left visible inside. When we go diving here, we usually take some friends along who aren’t divers so that they can make sure our stuff is safe while they enjoy the scenery. Imagery ©2017 Google, Map data ©2017 Google. The Three Graces or Crab Rocks dive site is a fun navigation puzzle with good spearfishing and crabbing. The main site is around the Three Graces. Stick close to the rocks and remember than heading east gets you to land. Good navigation skills are a big help here especially when the current starts playing tricks on you. The rock further north (called Painted Rock on NOAA navigational charts) can also be dived although a longer surface swim is necessary to reach it. There are a few smaller rocks in between that might be worth checking out if you feel like navigating to them. The entrance and exit is along the railroad tracks. Follow the path that crosses the railroad tracks and pick your favorite spot to climb over the low jetty to get to the water. One spot is much easier than the others. Scout ahead before you jump in. This is so far in the Tillamook Bay that you won’t have any surf or surge. You will have current though. The current swirls around the Three Graces in unusual and somewhat unpredictable patterns. It makes this a great navigation puzzle site. We have seen anywhere from 10 to 25 feet of visibility depending on time of year and upstream river conditions. This site can be as cold as 38F and as warm as 57F depending on what is happening upriver in the Coast Range. Cold winter rains can really chill the water here while hot summer days can make the water pretty warm. We like diving here in the spring and fall the best although the site is diveable year round. We once logged 51 feet here in some potholes by the base of the three graces before but most of this site is pretty shallow. This site is accessible to anyone with open water SCUBA certification although you will want to have sharp navigation skills because of the complex nature of this dive site. We rate this as an easy beginner dive because there isn’t much that can go seriously wrong at this site. You would have to really work at it to get sucked out to sea from here. There is boat traffic in the shipping channel but sticking close to the rocks you won’t have any troubles with that. The entrance does require a small jetty scramble but it’s nowhere near as intense as many of the other jetties along the Oregon coast. It’s about a 200-300 feet walk to the best area to enter. You will want to surface swim maybe 100 feet out to get to deeper water before you descend. At low tide, this site is really not diveable. This is much more enjoyable at high tide. Taking gear to spearfish or crab can be a fun way to spice this site up if you have gone diving here before. We have a list of gear that we use when we go spearfishing and crabbing over at our Gear We Use page. There used to be a dive shop in Tillamook although we haven’t been able to confirm in a few years if it is still open or not. Garibaldi and Rockaway Beach both have good restaurants. Tillamook County Parks operates several campgrounds in the area. We haven’t tried any of the local hotels so please let us know if you know of a good hotel that is SCUBA diver friendly! Just went out for two dives. Great topography around the rocks. Went down to 50+ west of the channel between Crab Rock and Three Graces. Mitridiums everywhere on the rocks. The best entrance we found was at a fir tree with a post. Anyplace else was just rough. Second dive was north of the Graces. Good dive with fun currents. Keep an eye on your compass.